This is a Nama-chozo sake, which means it is left un-pasteurized until the bottling stage; this adds zestiness to the mouthfeel. Refreshing aromas of bananas and tropical fruit. The finish offers hints of licorice and white pepper over stone-driven mineral notes. Best served chilled. Bulzai "hits the mark" with a wide range of appetizers and fish dishes. Pairings: Perfect by itself or with lightly seasoned foods. Sushi, sashimi, seafood salad, steamed or grilled white meat fish, oyster, cooked scallops. The Obata family crest is Four Diamonds. These represent the three elements that are commonly held to be crucial in sake brewing: "Rice", "Water" and "Humans" (Brewers). In addition to the aforementioned three, the brewery takes into account the importance of "Climate and Nature" (Terroir). 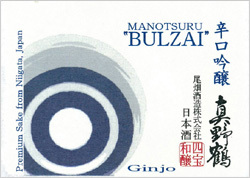 Their motto is to brew sake where the "four treasures" may work harmoniously to produce a well balanced product.